2015 First Quarter Legislative Highlights: Local Control Dominates, We Salute You Health and Safety Advocates! DogsBite.org - Municipal associations and grassroots advocates are dominating so far in 2015. During the first quarter, all five state preemption bills prohibiting local governments from enacting breed-specific laws were rejected. This is a 100% success rate for cities and counties retaining local control. Grassroots advocates helped make this victory possible -- we salute you! This post is dedicated to each of you and to all who will help us fight future state preemption law battles. Many state legislative sessions occur in the first 90 or 120 days of the year. This is true of the five states in early 2015 that considered state preemption bills that would bar local pit bull ordinances: Arizona, Georgia, Kentucky, Montana and Washington. This year's 3-month period can only be described as "frenzied" as the bills moved in and out of committees and chambers, at times rapidly, each one on a different (or unknown) voting schedule, simultaneously in multiple states. Just tracking the bills at times was difficult; each state has a different website structure and logic, some are modern and others are not. More importantly, each state also has its own nuanced legislative system, legislative rules and traditions. This is where lobbyists and insiders come in handy, people who know how that state system works. Our cause does not have either type of entity nor do we have any formal legislative organization. The upshot is that the two primary pushers of these state bills, Utah-based fighting dog advocates Best Friends and dog breeder interests, have both and still lost all five states! One of the toughest lessons learned in early 2015 concerns public hearing information. There often isn't much public access to it. Even when there are state laws, such as in Washington where 5 days notice is required for a public hearing, the rules can be suspended by a majority vote at any time. Of all five states, Washington had the best email notification system for tracking bills and public hearing announcements, but even that system failed when it was needed the most. If there is no adequate announcement of public hearings, how can the public participate? They cannot and that we learned is by design. Therefore, no victims' advocates appeared at the February 11 hearing.2 Supporters of HB 1018 were somehow notified and did attend. Only by manually checking the legislative website -- by habit on February 12 -- did DogsBite learn the hearing had already occurred. Fortunately, it was videotaped, so we were able to quickly send the link out to advocates who watched it then wrote to committee members with corrections to inaccurate statements made by supporters of the bill. The kicker, however, turned out to be Rep. Appleton herself. The ethereal oral testimony given by Rep. Appleton is riddled with "personal" and anecdotal statements (Fast forward to 1:37 to watch). DogsBite.org was so alarmed by it that we transcribed her testimony in full to share with others then fired off an email to the committee chair pointing out that Rep. Appleton's only citation given during her testimony, a 1920 United States Supreme Court decision, was 100% inaccurate. I watched the public hearing for HB 1018 that would terminate the right of local governments from regulating dangerous dog breeds in the state of Washington. I also transcribed Rep. Appleton's oral testimony, which is filled with "personal" and anecdotal statements and lacks even the most modest citations. However, she did cite one case by the U.S. Supreme Court in 1920, Nicchia v. New York, and alleged that the decision found that it was "unconstitutional to have breed-specific ordinances" (her exact words). I will briefly explain why Rep. Appleton’s reasoning is like saying Brown v. Board of Education supports separate schools for black and white students. Part of the primary basis of the Nicchia v. New York decision relies upon the U.S. Supreme Court decision in Sentell v. New Orleans & Carrollton R. Co. - 166 U.S. 698 (1897), which determined that the "property in dogs is of an imperfect or qualified nature" and that government officials could shoot and kill loose dogs that pose a danger to the community. Grassroots participation in Arizona was unnecessary as Senate President Andy Biggs kept Senate Bill 1292 buried in the Rules Committee. The main lobbyist for Best Friends, Ledy VanKavage, issued an alert to their Legislative Action Center on February 12: "AZ: Tell Senate President Biggs to stop obstructing SB 1292. Demand action now!" Senator Biggs was not moved. The state preemption bill received a ceremonial first reading on the eve of sine die, session adjournment. Fortunately, SB 124 did not see much action after passing out of the Agriculture Committee on February 24 and being assigned to the Rules Committee the next day. It also died in Rules, the committee chairman never sent it to the Senate floor for a vote. Even an announcement by the AKC did not help move the bill. Montana Senate Bill 239 did make it out of committee and lost by only 3 votes on the Senate floor, 23 to 26 on Feb 21. The bill was then "indefinitely postponed." A close call indeed, but the bill still would have had to pass the House. VanKavage decried on her Facebook page, "failed in the senate by 3 votes. Aghhhhhh. Guess we will have to try again in another 2 years." Georgia House Bill 124 was the last to come to our attention in late February. At that time the bill was sitting in the House Governmental Affairs Committee slowly dying; the committee chair was unwilling to give the bill a public hearing. We all breathed a sigh of relief; there were already three active bills in other states. Then Senate Bill 184 was introduced by a more powerful legislator. The Senate version accomplished the same preemption goal as HB 124, just stated in a different way. The other side was scrambling. They knew HB 124 was dead and the March 13 crossover date was looming. Many states have a crossover deadline when a bill must pass one chamber or be declared dead. SB 184 was referred to the Senate Agriculture and Consumer Affairs Committee, where three of the bill's sponsors held a seat. The bill quickly reported out favorably. On March 11, just two days later, the bill was on the Senate floor and passed in a sweeping 42 to 11 vote. On March 13, the Senate version of the state preemption bill landed right back into the House Governmental Affairs Committee whose chairman had not shown interest in the House version. Would the chairman call a hearing before sine die? Unlike in Washington state, the typical hearing announcement in Georgia is about 24 hours notice. We reached out to Rep. Keisha Waites and alerted her to the bill, she had previously helped Angela Rutledge after the death of her son. On March 27, just days before adjournment, the chairman called for a hearing on SB 184 on March 30. Rep. Waites attended, but it was a closed hearing. We then learned that the chairman never allowed her to speak. This news was unbearable! We also learned that a municipal association group put forth an amendment during the meeting, lessening the blow of the bill, but the other side balked. The state preemption bill was then tabled, three days before sine die. In both Washington and Georgia, bills from the 2015 legislative session carry over into 2016. We anticipate an extensive battle in Georgia and so do their legislators. On March 31, Rep. Waites submitted House Resolution 906 with four sponsors, "urging the State of Georgia to consider the devastation caused by pit bull attacks when crafting legislation regulating dogs so as not to impose on local governments that choose to regulate those dogs for the safety of the community." Please send each of these courageous Georgia Representatives a thank you email today! We cannot fix poor tracking systems or how public hearings are scheduled, typically with no hard or fast rules. But we can anticipate both realities in the future. There were times this year when many of us felt jolted by the lack of a democratic process that we had expected to be present in a state legislative system. That was the hardest lesson to learn of all, we were simply too naïve. 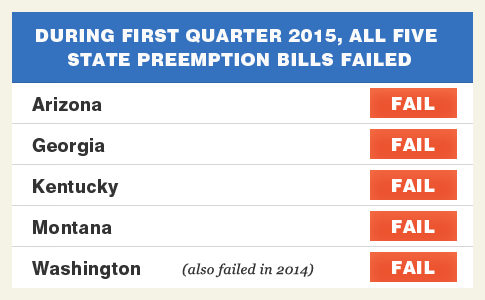 Despite this, all five state preemption bills failed and we know that advocate engagement helped! Thank you so much for all of your hard work advocates! But, 2015 is not over -- a similar preemption bill was just introduced in North Carolina. Immediate at-risk states, as of second quarter 2015, include North Carolina. On April 14, state preemption bill HB 751 was filed that prohibits local governments from enacting breed-specific ordinances.4 At-risk states in 2016, expected to again face these state preemption bills, include: Arizona, Georgia, Kentucky and Washington. In Georgia and Washington, both state preemption bills introduced in 2015 automatically carry over into 2016 (known as "carry-over" legislation). Advocates please also read the related post, 2015 First Quarter Report and a Primer on State Preemption Laws, for a deeper understanding of these laws; the post also contains visual charts. 1To add to the mystery and confusion, when we complained to Legislative Support afterward (and sent screenshots), they told us the email alert went out on 02/04/14. At the time that we read that email, we presumed they had meant this year, 02/04/15. Only by revisiting the email while writing this post did we catch this conflict. You can see on our screenshot 2014 alerts as well, including 02/04/14. That alert did have information about last year's bill (HB 2117). Even Legislative Support told us conflicting information! At the end of the day, there remains no explanation as to why we never received the alleged February 4, 2015 notification. 2Alex Soldano, who represented the city of Pasco did appear. Pasco has a breed-specific ordinance that declares pit bulls "potentially dangerous." Soldano put forth key amendments, "so that hopefully we can come to a friendly agreement and this piece of legislation can move forward," Soldano said. Key amendments included allowing current jurisdictions with pit bull ordinances to keep them, so long as they allow for due process, along with exempting pit bulls from local ordinances if the dog passes the AKC Canine Good Citizen test (bad idea, but compromise is required in a bicameral system). 3We later learned that along with the confusing sign up process, once inside the Bill Watch system, there was yet "another" email configuration required if you wanted email notifications sent. We never received any emails because we had not known about this second tier (until after sine die). Despite these struggles, the Bill Watch system it turns out had no notification for the Feb. 17 public hearing anyway. That could only be learned by manually checking the daily Legislative Calendar in a different area of the website. Lessons learned! 4After locating HB 751, we performed more searches on the legislature's website and found that HB 271, a separate state preemption bill, was also filed in North Carolina in mid March. The preemption clause is buried within HB 271, which overhauls the state's dangerous dog law. HB 271 modifies section: 67-4.5. Local ordinances (see existing wording). Underlined type shows the bill's "added" preemption language. "Utah-based fighting dog advocates Best Friends and dog breeder interests"
Many people still have no idea that breeder interests are integrated into the interests of Best Friends Animal Society. Best Friends spends millions upon millions of dollars every year to try to convince people that they want to help animals, but the financial interests of dog breeders somehow always ends up aligned with Best Friends interests. The dogs are losing big time. And that's before we even start to talk about the human and other animal interests paying the price for this kind of lobbying. And they wonder why more and more people are wary of dogs.